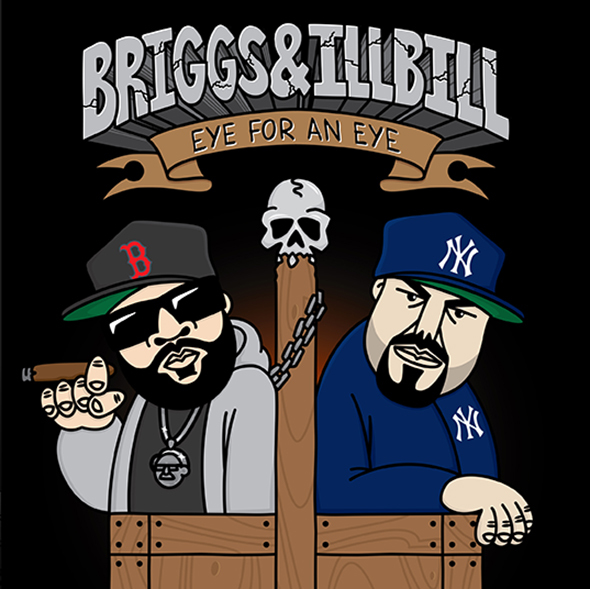 To coincide with the video release of “Eye For An Eye” featuring Ill Bill and Record Store Day 2015 Briggs drops a limited edition 7 inch vinyl, A3 poster and t-shirt with design handled by Mark 563. “Eye for and Eye” is the 4th single from Briggs critically acclaimed sophomore album “Sheplife”. After touring with Ill Bill in 2011 Briggs had made it a priority to record with Bill and cross off one of his bucketlist collabs. Briggs enlisted Trials (The Funkoars) to craft the beat and Bill recorded his verse in New York and promptly sent it back. When Ill Bill returned in 2014, Briggs and Bill recorded the gritty street film clip and put it in the vault to be released ahead of the final piece of the puzzle, a 7″ vinyl record with the track on the A side and a stomper remix by Simplex on the B side.